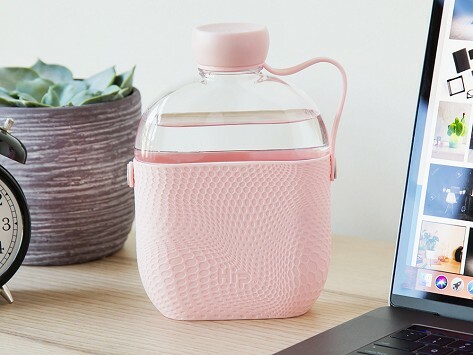 Stowing this stylish water bottle in a bag or backpack is easy thanks to its classic flask-shaped design. It’s made modern with durable Tritan plastic, colorful silicone touches, and its give-back mission. For every bottle sold, safe drinking water is provided to those in need through a partnership with Water For People. Dimensions: 4.8" x 2" x 7.25"
Love the style and size. Richard Smiedt and Karim Rashid aren’t strangers to reinventing the water bottle. We launched the Bobble, their self-filtering water bottle in 2010. We like their fresh take on the classic flask, and the way they are committed to giving back.